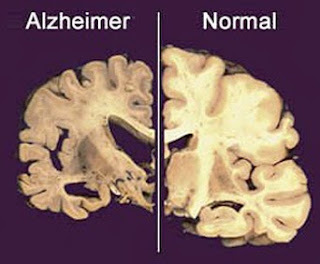 Alzheimer's disease is a particular type of dementia that comes an increase in incidence in recent years, and this was associated with increased longevity. Much research has been carried out in order to discover the mechanisms that trigger this disabling disease, however there are still no results that allow their prevention or treatment. Epidemiological studies show that people with increased blood glucose (hyperglycemia) due to the presence of diabetes or some other factor, are at increased risk of developing dementia, particularly Alzheimer's disease. These observations serve as evidence that changes in glucose metabolism can be responsible for molecular disturbances that occur in the brains of patients with Alzheimer's disease. Among these molecular disorders, the best known is the increased production in the brain of a peptide called B-amyloid, which accumulates outside the neurons, forming plaques which eventually affect the function of hippocampal neurons, the brain region responsible for the formation and storage of memories and the cognition. The aggregation of this peptide can start up to 15 years before the appearance of symptoms of the disease. In order to investigate a possible effect of increased blood glucose on the production of the peptide, with the consequent formation of B-amyloid plaque, a group of American researchers has developed a research in mice using techniques that allow us to analyze dynamically and in real-time changes in concentration of peptide B-amyloid in the hippocampus produced by glucose changes. The results of this research were recently published in the scientific journal The Journal of Clinical Investigation. The induction of acute hyperglycemia in young mice produced a significant increase in the peptide B-amyloid in the hippocampus. This effect was exacerbated in old animals and with a predisposition to the formation of plaque. These results suggest that repeated increases in blood glucose, even transitory, as occurs in type II diabetes, can initiate and accelerate the formation of B-amyloid plaque, a condition which favors the development of Alzheimer's disease. The information produced by this research shows the link between increased blood glucose and increased risk for Alzheimer's disease and serve as a focus on glycemic control.